An executor of a will is a person who handles the details of settling an estate according to the wishes expressed in the deceased person’s will. An executor is often an attorney or other professional, but it can be anyone over age 18 who is not a felon. An executor takes care of all paperwork related to the estate settlement, including filing the will and death certificate with the probate court and opening a new bank account for the estate’s funds. Taking inventory of the assets of the estate and providing a list of those assets to the court and heirs are also duties of the executor. The executor is responsible for paying all debts owed by the deceased. If more debts are owed than what is in the estate, these debts are paid in a specific order defined by the court. Depending upon the amount of money in the estate, federal, state and probate taxes may be due. The executor is responsible for determining if a tax return is necessary and then filing that return. The executor is the person who ensures that the assets in the estate are distributed according to the will. Dushinski, Kim. 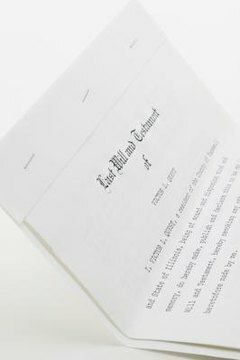 "What to Expect From the Executor of the Will After Someone Dies?" , https://legalbeagle.com/5883750-expect-executor-after-someone-dies.html. Accessed 20 April 2019.